On Thursday 21 March 2019 Her Place Women’s Museum Australia opened the doors at our new home at Clarendon Terrace in East Melbourne for a special donor and partnerships evening. This was an opportunity for us to share our vision and aspirations for what Her Place Women’s Museum Australia can become. We were delighted that both the Victorian Minister of Creative Industries, Martin Foley and the Victorian Minister for Women, Gabrielle Williams, attended, supporting the event, and thrilled that Minister Williams spoke so enthusiastically about Her Place and what it will mean to have a national museum for women located in Victoria. Finally, we were thrilled that Chloe Shorten and Senator Hanson Young could attend and show their support as well. If you would like to support Her Place and help it grow to become one of Australia’s pre-eminent cultural institution, please become a Friend of Her Place. Mary Stuart, HPWMA Chair, The Hon Gabrielle Williams, Martin Foley MP, Belinda Philp HPWMA Board Member. Emeritus Professor Gillian Triggs speaking. Mary Stuart, HPWMA Chair, Fatma Saaoud, and Emeritus Professor Gillian Triggs. The Hon Mary Delahunty, HPWMA Board Member. Her Place hosted nearly 100 year 9 and 10 students from disadvantaged schools across Melbourne as they had a chance to represent 24 Countries at a UN Model General Assembly on International Day of the Girl. The UN Association ran an inspiring day and the Immigration Museum was a fabulous venue and home for the UN. Girls worked in teams of four to research their country's stance on gender equity. A leader from each team then presented these views to the Model UN Assembly of Nations. Two presenters from Her Place Women's Museum Australia addressed the Assembly and outlined the United Nations binding conventions that guarantee human rights and prevent discrimination against women. Delegates were then challenged to decide how these rights sat alongside religion, tradition and customs. The economic success of Rwanda was also presented to the delegates. Rwanda is a nation with a difficult past but its redevelopment has been based on the central tenet of gender equality and is one of the success stories of Africa, with growing prosperity and the highest number of female members of parliament in the world. Delegates were also shown that war and conflict disproportionately affect women and girls and were reminded of the importance of involving women in any peace process. If women are involved in the peace process, the likelihood of its success increases by 35% and can last 15 years longer if women are part of decisions about the future. In the afternoon, countries caucused to move and amend Gender Equity Resolutions. Students were able to experience negotiation, lobbying and the use of power as they tried to prevail. Discussions were animated and strong - the energy in the room was inspirational. The Model United Nations Conference finished with countries voting on amended resolutions. Her Place received sponsorship for the attendees from Ethical Investment Services, Victorian Women's Trust, the Women's Electoral Lobby, Sheila Byard OAM and Women in Super. Youth Space for Her Place was a forum about how the voices of young people can be part of Her Place Women’s Museum Australia. Esther Lee-Scott and Amanda Thompson moderated a discussion with a panel of young thinkers, writers and activists, exploring how identity, diversity and feminism can be addressed within the institution. It proved to be an opportunity for Her Place (and the Immigration Museum) to consult with youth audiences about who inspires them and how institutional programs, activities and exhibitions can best represent and include young, diverse and intersectional feminist perspectives. Youth Space for Her Place was a collaboration between Her Place Women’s Museum Australia and Museum Victoria’s Immigration Museum. The workshop acknowledged the experience of Indigenous women and focussed on practical ideas that teachers can transfer and apply to their own schools. It aimed to provide local teachers with the skills to promote and implement gender equality initiatives within a whole school framework. How can a women’s museum change the world? On the Night that Changed the World, Her Place celebrated the power of personal transformation with a panel of women involved in bringing Her Place Women’s Museum to life. The panel discussion included four diverse women who have all contributed to Her Place Women's Museum Australia. 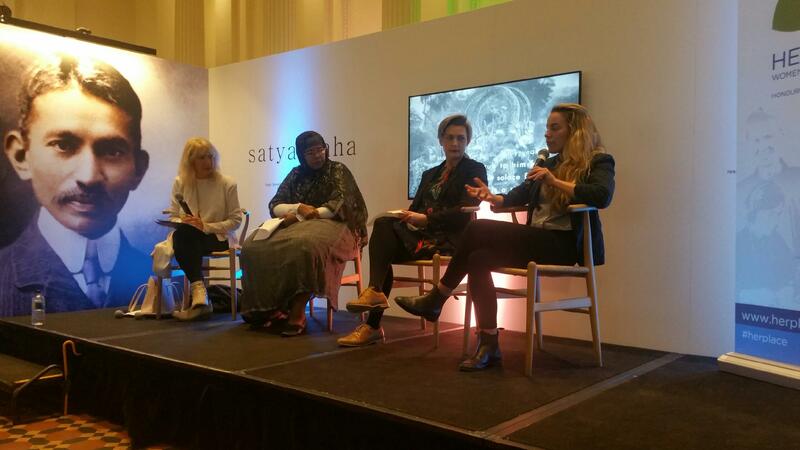 They asked, how can we make sure that women's stories and achievements are part of the national narrative? How can we honour women, inspire girls and educate all? Barbara Jennings (Moderator) – Barb has been a long-term activist for women.She has previously been a Director of the Queen Victoria Women's Centre and Women's Officer at the Australian Education Union. She was inducted onto the Victorian Honour Roll of Women in 2007. Jessica Duncan – Jessica is a young primary school teacher in Melbourne’s west, where she has been very active in practical strategies to build gender equality in the school environment.She is a member of the Her Place Education Committee. Halima Mohamed – Halima has been a community activist for nearly 30 years.Born in Somalia, she worked in parliament there for more than 10 years. Since arriving in Australia, Halima’s passion has been in building and nurturing communities. She has led initiatives such as the African Women’s Social Enterprise. She was inducted onto the Victorian Honour Roll of Women in 2008. Briony O’Keeffe – Briony is the founder of the Fitzroy High School Feminist Collective and an international expert on curriculum designed to build gender equality in the classroom. Briony is a member of the Her Place Education Committee. Pictured from left to right: Barb Jennings, Halima Mohamed, Briony O'Keefe and Jessica Duncan. Integration of Gender Equality strategies into your classroom and curriculum. A guided tour delivered by an experienced teacher from Her Place, designed to provide students and teachers with an overview of Her Place Women’s Museum Australia and its contribution to the Once Women Won the Vote exhibition. During the session, students had access to the curriculum-linked education resources, learned about the profiled women and heard about the importance of gender equality for all. In 2016 one of Australia's most significant feminist murals was defaced. The Women's Mural: Bomboniere to Barbed Wire, in Smith Street, Fitzroy, was painted in 1986 by Megan Evans and Eve Glenn. Measuring 50m x 12m, it celebrates the diversity of women living and working in the communities of Northcote and Preston. Its 'capping' (covering over) by notorious graffiti tagger Nost in February 2016 roused community action, emphasising the need to preserve the history of women's voices and stories in the public realm. In this free onsite talk, co-artist Eve Glenn with Sally Northfield and the Women’s Mural Documentation Project team discussed the origins, ideas and impact of the Women’s Mural and stories of some of the women depicted. This talk was presented as a collaboration between the Women’s Mural Documentation Project and Her Place Women’s Museum Australia as part of the Australian Heritage Festival. Free Public Discussion – The Round Table: Do we need a Women’s Museum? 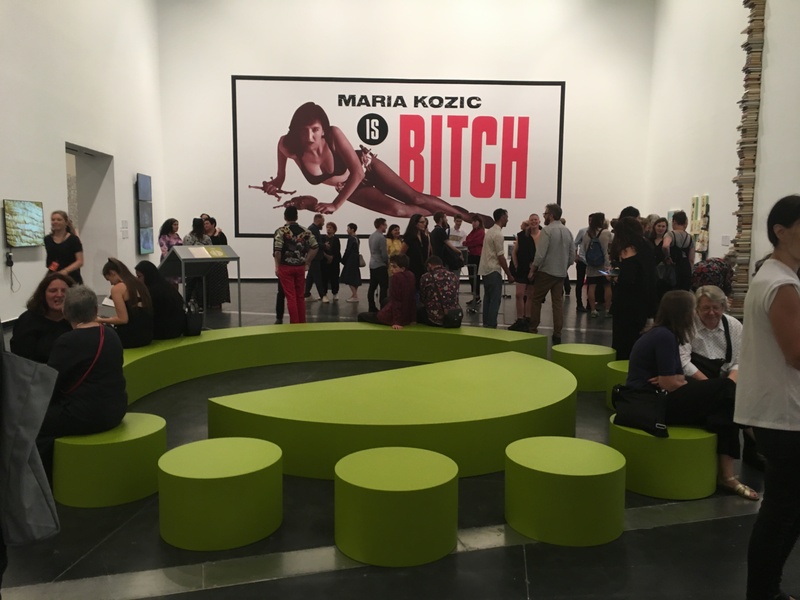 During the ACCA's major exhibition on feminist art practice, Unfinished Business: Perspectives on art and feminism, various artists, educators and groups were invited to host events at a specially constructed ‘Round Table’ positioned at the heart of the exhibition. The table played on the idea of the kitchen table as ‘a place around which women, artists and activists gather to discuss, debate, create, form allegiances and plan for a more equal future’. In the lead-up to International Women’s Day 2018, Her Place hosted a Round Table discussion asking: Do we need a Women’s Museum? 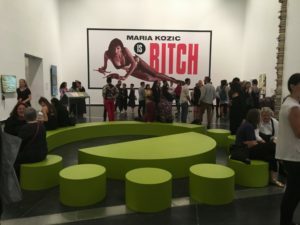 The conversation was convened by Her Place manager Penelope Lee and curator Clare Williamson, and the speakers included Stella Bridie, Dr Natalie Kon-yu and Kate MacNeill. Members of the team working on the Invisible Farmer Project, the biggest national study of Australian women on the land, alongside other research and archive experts discussing how and why collecting, documenting, digitising, cataloguing, curating and exhibiting women's archives and stories are important. Audience members were invited to bring along their own stories, documents, images and objects that pay tribute to the extraordinary women of the land in their lives. Helen Morgan, Her Place Deputy Chair, Archivist and Research Fellow at the eScholarship Research Centre, University of Melbourne, lead a discussion with Museums Victoria’s Invisible Farmer Curator, Catherine Forge; University of Melbourne Researcher and Executive Officer of the Australian Women's Archives Project, Dr Nikki Henningham; Ashley Robertson, Manager, Victorian Collections, Museums Australia (Victoria) and Ellie Wallace, postgraduate student who has conducted research into the distributed archival collection of Australian Women in Agriculture. A discussion on current initiatives around collecting, preserving and sharing of women's contributions and records, and the value of doing this for the wider community. Heather Mutimer and Cr Kate Redwood AM told the story behind the Heather Mutimer Women's Honour Roll and its importance to women and the local Hepburn Shire community. Helen Morgan, of the Australian Women's Archives Project and the Australian Women's Register, articulated the case for keeping women's records and why she became involved with Her Place Women's Museum Australia initiative. Anne E. Stewart shared stories that celebrate the strength, courage and contribution of women from the region, tales of our extraordinary women and their deeds. Anne is a Daylesford-based, intentionally renowned storyteller with the passion, energy and voice to engage any audience. For forty years she has been telling stories and developing a repertoire that celebrates women through story as well as the shared narratives of Australia that honour Indigenous, Celtic, Asian and world stories. The Invisible Farmer Project is the largest ever study of Australian women on the land. Funded for three years (2017-2019), the project involves a nation-wide partnership between rural communities, academics, government and cultural organisations. Feedback about the amazing women, past and present, who have made a difference to their communities is vital to the success of the project. You can find out more about the project here: www.invisiblefarmer.net.au. This workshop aimed to reveal the ‘hidden histories’ and write tributes to women who should be recognised. Participants shared stories and gave public recognition to the extraordinary, creative and vital roles that women have played in agriculture and farm communities across Australia. Participants also gave the project team the opportunity to potentially profile women’s stories via future research and in-depth studies. The Victorian Honour Roll of Women aligns closely with the vision of Her Place Women’s Museum. Established in 2001, the Honour Roll pays tribute to women who have been pioneers in their fields and who have improved the lives of women and the broader Victorian community. This event aimed to link in and engage with local women’s organisations and individual women in order to discuss the plans for a vibrant physical space and online resource that will educate audiences and celebrate women’s valuable and distinctive contributions, past, present and future. A panel discussion about the role of serendipity, family stories and fragments of paper in the writing of history, including so-called ‘big picture’ academic history. Panellists included Dr Rosemary Francis and Helen Morgan, and was convened by Dr Nikki Henningham, Research Fellow – Australian Women’s Archives Project. An informal lunchtime conversation with the women featured in the exhibition including Halima Mohamed, Paola Balla and Ruth Crow researcher Claire Collie. A night of live readings of bold and irresistible feminist texts by a selection of diverse feminist educators, students and practitioners, including Clare Land, who read from her book ‘Decolonizing Solidarity’. A guided walk through Footscray focusing on the lives of women who have made a difference and contributed to the West. Through spoken word and recounted experiences, walkers heard stories about women of tenacity – leaders, advocates, storytellers and speakers of injustices. Produced by Chantal Wynter. This event brought together academics, activist groups and philanthropic organisations to showcase their work and share their aspirations for 2017. Feminists across all sectors had the opportunity to get together, meet others and build partnerships. Hosted by the Victoria University Feminist Research Network, a community of feminist scholars from Victoria University in conjunction with Her Place.